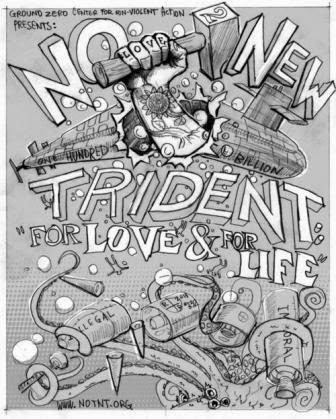 NO To NEW TRIDENT - For LOVE & For LIFE: No Nuclear "fire and fury" Ever Again! Preventing the Unthinkable! I wouldn't normally send another GZNonviolenceE-Newsletter so soon, but these are anything but normal times! "Crisis" is not too strong a word to describe the situation! "They [North Korea] will be met with fire and fury like the world has never seen. He [Kim Jong-un] has been very threatening ... and as I said they will be met with fire, fury and frankly power, the likes of which this world has never seen." Trump's extremely provocative statement was in response to news earlier in the day that North Korea can now arm its long-range missiles with nuclear warheads. While it is true that North Korea has nuclear weapons (and says it is prepared to use them in response to any attacks by other nations), and that it can at least reach its neighbors with them, there is NO military solution to this situation. Trump outrageous and inflammatory statement has brought tensions with North Korea to a new (and extremely dangerous) high. The consequences of any military action against North Korea would be catastrophic, and Trump's words threaten not only North Korea, but potentially millions of people in South Korea, Japan and other nations in the region. Amid the escalating war of words between Trump and North Korean leader Kim Jong-un, Defense Secretary Jim Mattis is reportedly visiting Seattle and the Bangor Trident nuclear submarine base 20 miles west of Seattle on the Kitsap Peninsula today and tomorrow. The August 7th Department of Defense (DoD) news release said Mattis would be visiting Naval Base Kitsap-Bangor within the week to be briefed by Submarine Group 9 leaders, and taking a tour of the Ohio-class ballistic-missile submarine USS Kentucky. The Bangor submarine base, just 20 miles from Seattle, has the largest concentration of deployed nuclear weapons in the U.S. If Washington state were a sovereign nation, it would be the third-largest nuclear-weapons state in the world. At this moment it is likely that at least two of the eight Trident submarines home-ported at Bangor are on patrol in the Western Pacific region, ready to launch their thermonuclear-armed missiles on the direct order of President Trump. The USS Kentucky, the Trident submarine that Defense Secretary Mattis will tour at Bangor, is estimated to carry about 108 nuclear warheads. 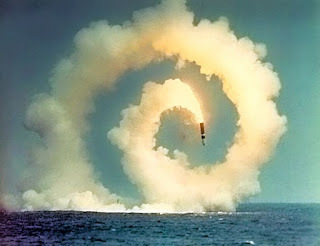 The W76 and W88 warheads at Bangor are equal respectively to 100 kilotons and 455 kilotons of TNT in destructive force. One submarine deployed at Bangor is equal to more than 1,400 Hiroshima sized nuclear bombs. Mattis' visit to the Bangor Trident base underscores the importance that the US Government places on nuclear weapons and particularly on what it calls its "strategic nuclear deterrent," of which Trident is the most important "leg" of the nuclear triad (submarines, bombers and land-based missiles). No one knows where this escalating rhetoric of President Trump and North Korean leader Kim Jong-un will end. To take either leader at his word, a nuclear holocaust is an acceptable event. The current situation is analogous to two unstable people standing with lighted matches on opposite sides of a swimming pool filled with gasoline. Without a change in course it is only a matter of time. Ground Zero Center for Nonviolent Action condemns Trump's statement, and we call on our members of Congress to respond immediately to de-escalate this crisis before the unthinkable occurs. Please contact your members of Congress today and call on them to demand that President Trump immediately stop threatening North Korea and authorize the State Department to utilize all diplomatic tools at its disposal to reduce tensions with the North and resolve the nuclear crisis. Click here to find contact information for your members of Congress. If you live on the Kitsap Peninsula, Representative Derek Kilmer will hold a Town Hall Meeting this evening from 5:30 to 7:00 at North Kitsap High School Auditorium, 1881 NE Postmark St, Poulsbo, WA 98370. Please also support the effort to restrict the president's authority to launch a nuclear first strike. Although we never want to see nuclear weapons used again, the Restricting First Use of Nuclear Weapons Act would, at least, prohibit a president from launching a nuclear first strike without a declaration of war by Congress. It's a step in the right direction. When you are done, please share this E-Newsletter with your network and, if you are in the Puget Sound region, join us this coming weekend to not only commemorate the anniversaries of the atomic bombings of Hiroshima and Nagasaki, but to also speak out and take action to abolish these horrific devices of nuclear extinction that threaten all of humanity. Click here for information on this weekend's events. Future generations rely on our actions! We must not let them down. Let us keep working together to ensure that the horrific "fire and fury" that was unleashed on hundreds of thousands of our fellow human beings 72 years ago will never be seen again. No More Hiroshimas! No More Nagasakis!